​​​"Music has a power of forming the character and should therefore be introduced into the education of the young." SJCS has three choirs, the LITTLE LAMB CHOIR consisting of students in grades 1&2, the JUNIOR CHOIR consisting of students in grade 3-6 and the SENIOR CHOIR consisting of students in grades 7-12. 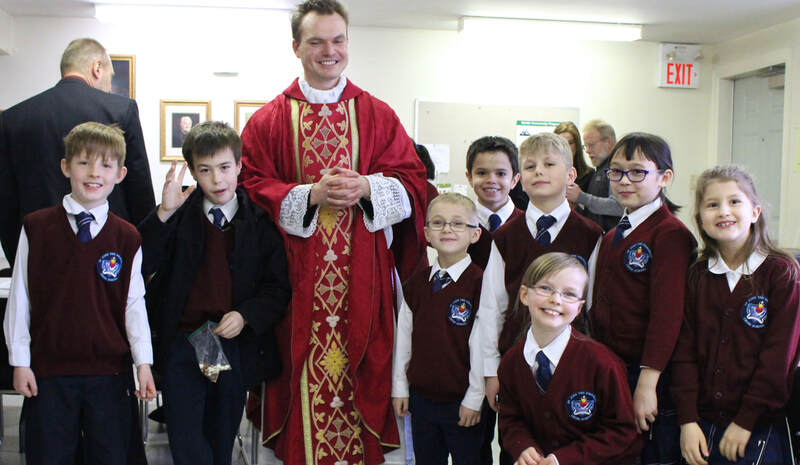 SJCS students are taught to sing repertoire from the Church’s great treasury of choral music; in this way the children are formed musically and spiritually, and come to appreciate their heritage as Catholics. The students also learn secular pieces, such as folk songs and theatrical musical scores, appropriate for their musical development. As well, we aim to produce an auditioned MUSICAL THEATRE production every second year. Previous plays have included Fiddler on the Roof and Beauty and the Beast, and both were a resounding success. Click to listen to a recording of AVE MARIA. View our YouTube channel for more music including our highly acclaimed musicals. Join us for First Friday noon masses at Our Lady of Assumption Church September to June. Homeschool students may join the bi-weekly Junior (grade 3-6) or Senior (grades 7-12) choral program without joining the academic program. Choral only students are required to purchase a uniform, attend bi-weekly rehearsals and sing at all First Friday masses as well as outreach events and concerts. Grades 1 & 2 students will make up our new Little Lamb Choir. Students will learn age-appropriate skills by the Ward Method of instruction. Little Lambs will participate in some of the scheduled SJCS performances. Grades 3-6 students make up the Junior Choir. Students learn music by the Ward Method of instruction, a method which emphasizes solfege, sight reading, and accurate intonation. Here is more information on this method of musical instruction which is making its way back into excellent choir schools. Grades 7-12 students make up the senior choir. The focus of the senior choir program is on sacred music, especially that which is suited to the sacred liturgy of the Mass. The SJCS senior choir is trained to sing Mass settings, chant, polyphonic hymns and motets for the First Friday Masses at Our Lady of the Assumption Parish. The seniors also sing a variety of secular music, such as musicals and folk songs, and perform for audiences including SJCS families, senior groups, and hospice patients. St John Choir Schola aims to produce a high quality musical every other year. Past performances have been very successful and there are many opportunities for students to become involved in the production from auditioned acting roles and the chorus, to helping with the technical side of the show. See our Youtube channel to see a sample of our most recent productions. Along with our outreach events where the children sing for seniors around the city, and our year-end spring concert, SJCS also invites the larger church community to join us for a beautiful liturgy at Christmas called Nine Lessons in Carols. St John Choir Schola, as a community, practices the First Friday Devotion to the Sacred Heart of Jesus by singing at the First Friday Masses. The senior choir sings the Mass setting, hymns, and motets, and the junior choir and staff join other family members and attendees.